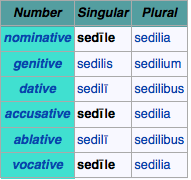 In my opinion, A&G make too big a fuss over mixed i-stems, which are essentially a broad class of nouns that usually feature a genitive plural in -ium and might feature an accusative plural in -īs, but are otherwise regular third declension nouns. 1. Nouns in (n.) -ēs, (g.) -is. fidēs, -is (f.) faith, trust, loyalty, reputation, etc. 2. All monosyllable nominatives in -s or -x preceded by a consonant. 3. 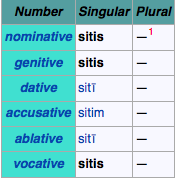 On the following monosyllable nominatives in -s or –x preceded by a vowel. 4. Polysyllable nominatives in -ns or -rs. This does not apply to all present active participles! 5. Patrials (nouns denoting birth, class, abode) in -ās and -īs. As A&G note, “The i-stem was confused by even the Romans themselves.” There are a variety of variations with this stem present in all three grammatical genders, making it incredibly difficult to organize the data except in broad patterns and rote memorization. To that effective, I’m going to design a series of posts on the i-stem declension. In this section, we’ll introduce the i-stem as a morphological class, and discuss the declension of ‘regular’ masculine and feminine i-stem nouns. First off, all i-stems are either pure or mixed. As you can see, there aren’t many markers (just one) that guarantee any given noun is an i-stem noun. 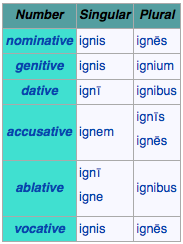 In fact, it would be possible to decline ignis in a way such that only it’s nominative singular and genitive plural gave any hint of the i-stem status. With four nouns in particular (imber, rain; linter, skiff; ūter, wineskin; venter, belly) this problem is even more evidence because here even the nominative is lost as a distinctive feature. The only morphological form that demonstrates imber‘s i-stem status is its genitive plural imbrium. The basic neuter i-stem declension takes the stem (mari-) and converts the final i- to an e- in the nominative and accusative singular. These are all regularized and there are no exceptions…except for the majority of nouns in the neuter i-stem declension, which don’t decline like this at all. Most neuter i-stem nouns have a consonantal base in -al or -ar, which is retained in all morphological forms. This causes only one change: these forms are animal, animalis, and not *animale, animalis. Everything else remains the same. There’s one feature that Wiktionary fails to capture in this chat. The -a- at the end of the stem is short in the nominative and accusative singular, but along everywhere else (see my lexical entry above). This is true of all i-stem nouns ending in –al or -ar. There you have it! The neuter i-stem declension. It’s fairly regular; it merely entails a large quantity of regular rules. The Romans referred to Jupiter, but also to Jove. How did this work? The nominative, Iuppiter, is derived from the archaic vocative Iū and pater (the word is a ‘syntactic compound’). The rest of the cases are derived from the stem Iov-, which A&G identify as related to the Greek Ζεύς through the PIE root *dyew. 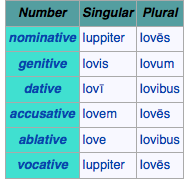 We can imagine that ‘Iovis‘ could serve a nominative, but the go-to nominative is definitely Iuppiter (or Iupiter). Generally speaking, the vocative and the nominative are the same. 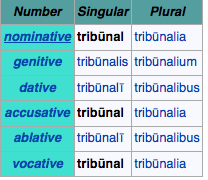 However, in certain nouns of the second declension (those with nominative -us or -ius) have two exceptional variations. All nouns in -us feature an -e in the vocative (mūrus…mūre). Those ending in -ius (Vergilius, fīlius, genius, etc.) take a vocative -ī (Vergilī, filī, genī). That’s how it stands for nouns. There’s a slight variation in policy for adjectives, though luckily the same general rule (same as the nominative) holds true for all but the second declension (bonus…bone). However, the one catch is that adjectives ending in -ius change to -ie and not -ī. Therefore, when calling to a Spartan son, we might say O fīlī Lacedaemonie! (not *Lacedaemonī). 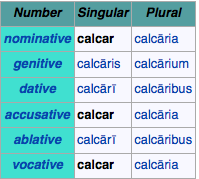 If anyone has a better understanding of vocative plurals, which I assume are all identical to their nominative forms, feel free to say more in the comments below. A&G are totally silent on this issue, which I assume signals that listing the vocatives would be redundant (with respect to the nominatives). These are not the Droids you’re looking for: haec Droidēs nōn sunt quae quaesis. These are not the Droids you’re looking for: quae quaesis haec Droidēs nōn sunt. These are not the Droids you’re looking for: haec Droidēs quae quaesis nōn sunt. These are both acceptable (albeit irregular/poetic) alternatives to the sentence above.